Fantastic Firework Displays and Mobile Discos from Firebird Entertainments. Firebird have been committed to providing professional entertainment for private parties, weddings, corporate clients and Royalty throughout this country and Europe for over 25 years. We are a highly respected company who are at the forefront of the entertainment industry. We pride ourselves on attention to detail and designing functions specifically tailored to each individual client’s requirements. 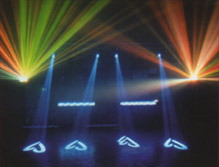 Firebird offer a wide range of discotheques, lighting and theme nights. DJs always come dressed in dinner jackets and bow ties (unless otherwise requested). The band were excellent – so unobtrusive getting in and getting out afterwards and the music was excellent – right up our street and everyone commented on the quality of the playing. They even managed a few tunes from musicals which I hadn’t asked for, but I am from a musical theatre group and it looked like I’d planned it beautifully!